If you are a serious learner of the Burmese language, you will note that the language you learn through books are different from how it is spoken in real life. Colloquial language has more practical use in everyday situation, including in marketing. 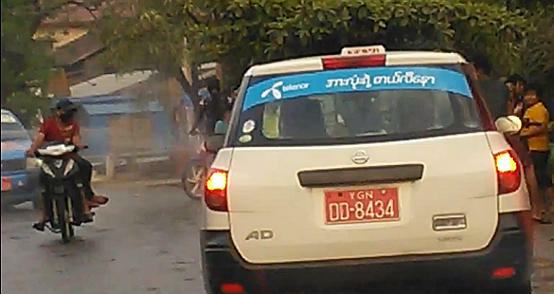 To give an example, Norwegian telecommunication company Telenor, the new comer to the mobile phone market in this country, uses the sales pitch: အားလုံးရဲ့ တယ်လီနော | ah3-lone3 yeare1 teare2-li2-nau3, where colloquial ရဲ့ | yeare1 is chosen over the literary ၏ | e1, which is a possessive word to mean "Everyone's Telenor". It does not mean, however, that it's a waste of time to learn the literary language. It has a rich and refined flavor compared to bland spoken words. And, you need this knowledge for understanding public notices, comprehending procedures, and reading newspapers. You need to differentiate the two apart so that you don't use the literary form of language in everyday conversation. ကျွန်တော်၏ အမည်သည် မောင်ဘဖြစ်ပါသည်။ | kja1-nau2 e1 a-myi2 dthi2 moun2-ba1 pfyit ba2 dthi2 - My name is Maung Ba. ကျွန်တော့် နာမည် မောင်ဘ ပါ။ | kja1-nau1 nun2-meare2 moun2-ba1 ba2 - My name is Maung Ba. ကျွန်တော် | kja1-nau2 means I (male term). Both colloquial and written language use this word. When it comes to the possessive terms like "my", "his", "her", spoken language just changes the tone into the first tone. ကျွန်တော် | kja1-nau2 becomes ကျွန်တော့် | kja1-nau1 - "my". သူ | thu2 - "he" becomes သူ့ | thu1 - "his". ကျွန်မ | kja1-ma1 - I (female term) is already in the first tone, so there is no need to change it. ကျွန်တော်၏ | kja1-nau2 e1 - my (male term). သူ၏ | thu2 e1 - his or her. ကျွန်မ၏ | kja1-nau2 e1 - my (female term). မောင်ဘ၏ကား | moun2-ba1 e1 ka3 means "Maung Ba's car". When spoken, you can either say မောင်ဘကား | moun2-ba1 ka3 or use ရဲ့ | yeare1 in place of ၏ | e1. E.g., မောင်ဘရဲ့ကား | moun2-ba1 yeare1 ka3. If the last digit of the name of the person is in the first or the third tone, there is no need to change the tone. If the name is in the second tone like သီတာ | thi2-da2, change it to the first tone in spoken language like this to express the possessive term: သီတာ့ကား | thi2-da1 ka3 - Thida's car. အမည် | a-myi2 - means name. In spoken language, နာမည် | nun2-meare2 is used for "name". Postpositional marker သည် | dthi2 has different usages depending on whether it is in the beginning of the sentence, in the middle, or at the end of the sentence. (Refer to lesson 37.) In the middle of the sentence here, at means "is". In spoken words, it is usually dropped. ဖြစ်ပါသည်။ | pfyit ba2 dthi2 - declarative statement on nature of things comes from the verb ဖြစ် | pfyit - "to be" . The polite word ပါ | ba2 can be used for both colloquial and literary language. The ending word သည် | dthi2 is literary equivalent of colloquial တယ် | deare2. An another literary variation to ဖြစ်ပါသည် | pfyit ba2 dthi2 is ဖြစ်၏ | pfyit e1. It is possible to convert the above sentence into colloquial sentence by direct substitution of words. Although no one will be 'declaring' oneself in such a manner, it is alright for a radio or game announcer to introduce a contestant in a third person word သူ့ | thu1 - his or her. သူ့နာမည်ကတော့ မောင်ဘဖြစ်ပါတယ်။ | thu1 nun2-meare2 gah1 dau1 moun2-ba1 pfyit ba2 deare2 - As for his name, it's "Maung Ba". The following selected list is arranged by literary words in က to အ order followed by colloquial equivalent. ငါ | nga2 - (informal male, female) (colloquial) - The first person "I" to address oneself. ကလေးတွေ ရန်ကုန်မြို့မှာ မွေးတယ်။ | kha1-lay3 dway2 yan2-gome2 myo1 hma2 mway3 deare2 - (child + plural + Yangon + city + at + born + ending affirmative word) (colloquial) - Children were born and brought up in Yangon. သွားမယ့်လူ ဘယ်သူလဲ။ | thwa3 meare1 lu2 beare2-thu2 leare3 - Who is the person going or leaving? Note: ဆို | hso2 could also mean to sing. သူလာရင် ကျွန်တော်(ကျွန်မ) သွားမယ်။ | thu2 la2 yin2 kja1-nau2 (kja1-ma1) thwa3 meare2 - I (I female term) will go if he comes. ငါတို့ | nga2 doh1 - (informal male, female) - "We", where speaker is either male or female. Members of "we" may include both sexes.